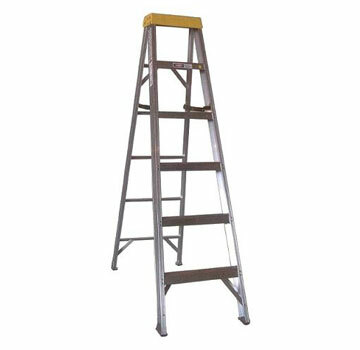 PRODUCT: 6 Foot Aluminum Step Ladder, Type 1A Extra Heavy Duty Industrial, 300 lb. Capacity, OSHA/ANSI Compliant. Made in USA by Sunset Ladder. Price/Each. 3" wide steps, bottom width 22.75", approxiamate spread 42". SHIPPING: Up to 6', use UPS for shipping rates. 8' and up, use Freightquote shipping options.